Danish financier; born in Copenhagen Jan. 18, 1753; died there Aug. 30, 1813. Meyer started in business for himself at a very early age, and during the period of general prosperity in the last decade of the eighteenth century his operations increased greatly, extending to transoceanic countries. On the death of his brother, who had for some time been his partner, Meyer associated himself with his nephew S. S. Trier, and founded the firm of Meyer & Trier, which occupied a prominent position in the world of finance. Several times the house had to face severe crises, as in 1795, when a fire devastated Copenhagen, and in 1799, when a general financial panic occurred. The firm, however, sustained no material injury to its commercial interests. In 1806 Meyer criticized the way in which the finances of the country were being administered, and he especially denounced the reckless issue of unsecured paper currency. During the depression of the money market due to the Napoleonic wars, he was summoned by King Frederick VI. (1808), who consulted him on financial matters of state. Meyer is said to have exercised a great deal of influence on legislation in those days; and, in common with other unofficial advisers of the king, he had to bear his share of popular hatred, perhaps not unmixed with envy. During a financial crisis in 1811 Meyer acted as the agent of the government in endeavoring to avert pecuniary disaster. Enormous sums were placed at his disposal; and it was left to him to decide whether applicants for funds desired the money for legitimate business purposes or for speculation, and to grant or refuse the requests accordingly. The Danish merchants did not long submit to his arbitration, but sought other means of raising capital. During the latter part of the year 1811 Meyer retired from active business, and in 1812 his firm received a letter of thanks from the king for its "arduous and self-sacrificing work in accordance with our will and desire." At the same time he received the title of "Hofraad." 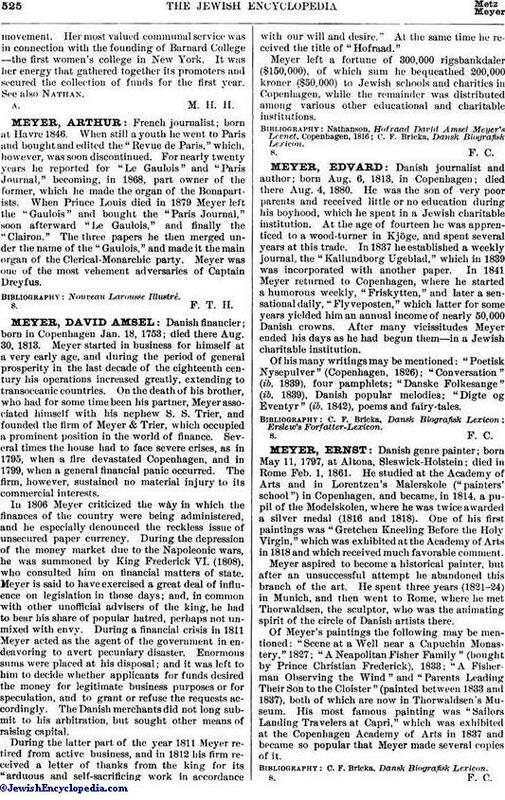 Meyer left a fortune of 300,000 rigsbankdaler ($150,000), of which sum he bequeathed 200,000 kroner ($50,000) to Jewish schools and charities in Copenhagen, while the remainder was distributed among various other educational and charitable institutions.